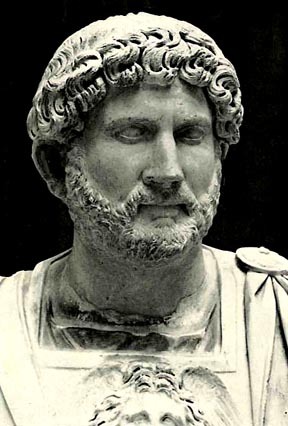 Hadrian (Publius Aclius Hadrianus): The son of Publius Aclius Hadrianus Afer and Domitia Paulina of Gadee, Hadrian did not descend directly from the sort of family that would have been expected to achieve emperor status. His grandfather had been a member of the Roman senate and had married Emperor Trajan's aunt, Ulpia. When Hadrian's father died in 85AD, he came under the control of Trajan and Publius Acilius Attianus, who brought him up to manhood. After joining the army, he was appointed a military tribune in upper Eastern Europe where he stayed until Trajan became emperor. Trajan promptly had him transferred to Rome to serve in the administration. As with so many career minded men, Hadrian saw an opportunity to further his standing by marring Vibia Sabina in 100AD. She was related to Trajan, being his niece's daughter. From there he took on a variety of posts, staff officer, legionary commander and praetor, before he became governor of Lower Pannonia. In 108AD he became consul to the province and stayed there until he moved to Syria where he was the governor during the Parthian War, where he again took the role of consul in 117AD. Then a remarkable series of events happened. On 8th August, Trajan died, but for some reason, the news of his death was kept secret for three days. Then along with the announcement of Trajan's death came another stunning piece of news. It was claimed that, on his deathbed, Trajan had adopted Hadrian as his son. Trajan's widow, Pompeia Plotina endorsed the adoption. Almost immediately, coins were issued to mark the event, which proclaimed Hadrian as a Caesar. (Hadriano Traiano Caesari) The Roman world had no option, other than to accept Hadrian as the new emperor, which they did with some reluctance, given the circumstances. At his inauguration, Hadrian declared that Trajan be deificated (given the status of a god) and he would follow his principles and methods of government. He further decreed that no senator would be executed while he was emperor. Almost instantly he went back on his word, for one of his first acts was to instigate a military policy that was completely different to Trajan's. In the east, he withdrew his forces, but left them under control of Rome appointed client kings and duly set taxes and levies accordingly. Because of the manner of his accession to the throne and his sudden reversal of policy, Hadrian made many enemies in the senate and the army. Hadrian countered this by gathering information on all those around him so he could draw up a list of those who were either pro or anti Hadrian. He then sorted these list into a manner that would show who were the most dangerous opponents to his rule. He now had three names that he could see were the ones he had to watch. One of them Gaius Calpurnius Crasus, met a sudden and violent death, and the other two came under permanent scrutiny. Hadrian had them followed wherever they went and received regular reports on their movements, where they went and who they associated with. In 118AD, Hadrian's spies told him of a sinister plot that was being hatched in Rome to topple him as leader. At the time he was in Bithynia from where he made haste to Rome. On arrival, he discovered that four ex-consuls had been executed. Two of them Lusius Quietius and Gaius Avidius Nigrinus, were suspected of being the two that Hadrian was watching from afar, All the same, despite his claims that he had nothing to do with these deaths, the senate believed he had given the order for their murders. An act that was in direct contrast to the statement he made when first becoming emperor. He had killed members of the senate. Something he said he would never do. 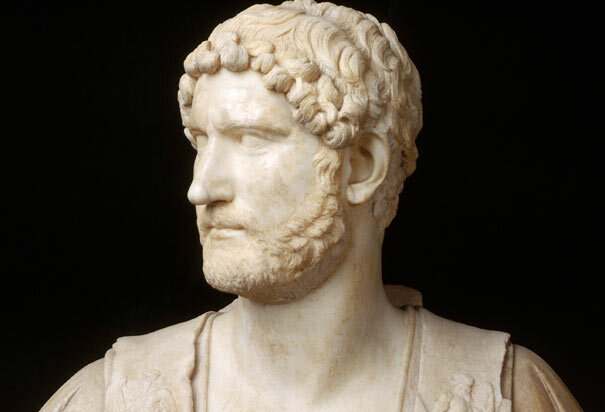 Hadrian knew he had to gain the support of the army and those with influence if he as to hold on to power, so between 121 and 132AD, he toured the empire meeting military commanders and the rulers of the provinces. While travelling, he settled disputes and satisfied the needs of the people of each province, in order to win their support. As befits a master tactician, he had coins minted for each province glorifying their achievements. The coins generally depicted a woman dressed in native costume, displaying the country's attributes. Hadrian saw the empire, not as a collection of countries ruled from Rome, but as something that was a whole being, with each province contributing something to the make up of the empire. 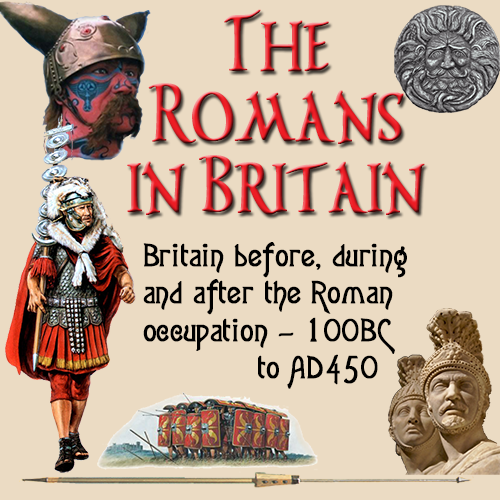 Although they were ruled by the Romans, each country was took keep it's own identity and traditions. The natives were to be pacified, rather than suppressed. The army took on new roles. Rather than invading other territories, they were now concentrating on consolidation of the Roman Empire, which meant a strengthening of all the frontiers. 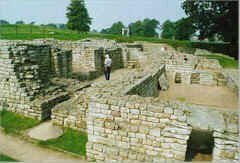 Perhaps the most significant and well known landmark he instigated was Hadrian's Wall, which separated Britannia (Britain) from the Scottish Caledonian and Pict tribes in the north. Where there were no actual boundaries, rivers, hills etc., he had fortifications built so that the whole empire was bordered and separate from the, as yet, unconquered lands. As such, the empire gained a period of stability, with the people of each country seeing the benefits of peace in their economies. The army too changed from being a mainly fighting force to one that was of help to the community. Whether by accident or design, the soldiers were either defending the frontiers or carrying out civilian duties, moving supplies, farming, quarrying. A far cry from the duties for which they had originally trained. Hadrian's rule was noted for it's lack of military conflict. Of course there were raids and minor skirmishes, but within the empire an atmosphere of peace prevailed. The only real war took place in Judea, where the Jews took a section of Roman land which they held for three years before they were overcome by the superior Roman forces. In the empire, he brought in many reforms to help the less privileged of society understand the law and their rights. Up until now, they had lived in ignorance of their rights and so knew little of the workings of government and how it could help them. Hadrian appointed Lucius Salvius Julianus, a black African, to review the edicts issued each year by the Praetors when they took office. The reforms of the legal system brought both praise and scorn. The people welcomed the changes because they brought about a fairer, more balanced way of administering the complexities of law. The upper classes saw it as a destruction of their old system whereby most appointments were based on the personal relationships of those involved, rather than their skills. But the system was not his only pressing concern. When his wife Vibia Sabina died in 128, he had no son to carry on the family name, and eventually take the throne. So he chose to adopt Lucius Ceionius Commodus, who took the name of Lucius Aelius Caesar and gave him the governorship of Pannonia. Until now, Hadrian has appeared to be something of a saint to the Romans, but he had the ruthless streak so well displayed in Roman emperors. To remove any possible challenge to the planned accession of Commodus, he ordered the main contenders to the throne, Julius Ursus Servianus and his grandson to be murdered. Then suddenly in January 138 Aelius died, and Hadrian adopted another son Antonine Pius. To ensure there would be no further problems for choosing a successor, he told Pius to adopt two sons of his own. He did this and took Marcus Aerelius and Lucius Verus, son of Aelius Caesar as his sons and heirs. All three of these did become emperors in later years. Hadrian must have realised he did not have long to live, as all this was arranged somewhat hurriedly before he died on 10th July in Baiae. His adopted son, Antonine Pius, became emperor and declared that Hadrian be made a god, much against the opinion of the senate.